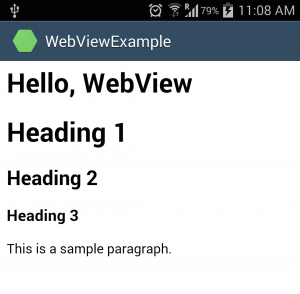 In the course of this tutorial, we will take a look into using WebView in Xamarin.Android. This tutorial loads simple webpage on WebView and using WebViewClient. WebView is an android UI component that displays webpages. It can either display a remote webpage or can also load static HTML data. This encompasses the functionality of a browser that can be integrated to application. Most of the android applications like WordPress, Flipboard, fiddly; Google Reader, etc. are integrated with WebView in order to display certain piece of online contents. It uses the WebKit rendering engine to display web pages and includes methods to navigate forward and backward through a history, zoom in and out, and perform text searches and more. The implementation of WebView is quite simple like any other views, all you have to do is declare the WebView layout on your Activity or Fragment, instantiate and load the data on WebView. Following section of the tutorial, will drive you with step by step approach to create a simple WebView with different configuration params and load stacktips.com home page. As discussed, let us create a simple WebView layout that covers the full screen space. Following activity class snippet will show you how to initialize WebView instance and load static Html string onto it. Like any other view controller, let us first instantiate WebView in your Activity by calling FindViewById() method. This requires you to import Android.Webkit package. Call LoadData() method that accepts your static Html string, mime type and the encoding format. The default behavior of Android is to open device browser, when links are clicked. But as our WebView should work like a embedded browser, we must override to always open the links in the WebView instead redirecting it to the default browser. We can do this using android WebViewClient. WebViewClient helps to monitor events in a WebView. We have to override the shouldOverrideUrlLoading() method. This method allows performing your own action when a particular URL is selected. Once we are ready with the WebViewClient, we can set the WebViewClient of your WebView using the setWebViewClient() method. The WebViewClient class has some other useful methods such as OnPageStarted(), OnPageFinished() and OnReceivedError() that helps you to show loading progress of WebView content, or handle error. 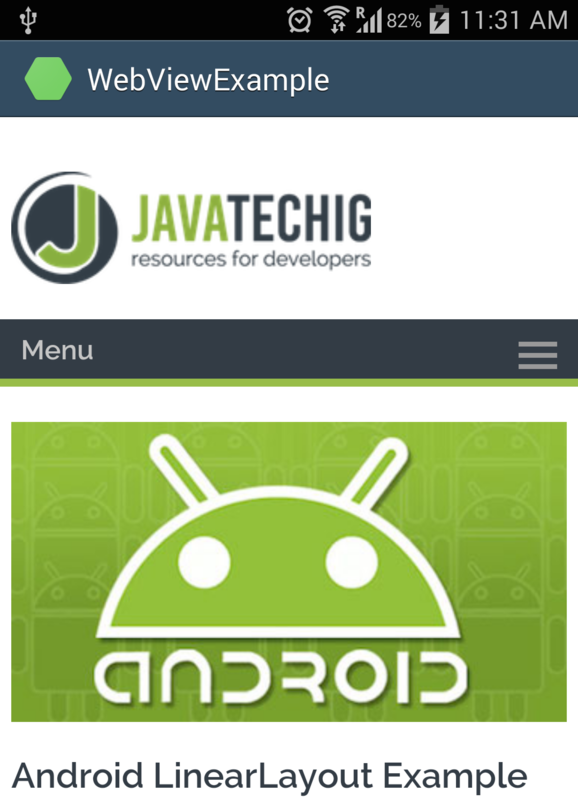 Checkout my Android tutorial that explains How to show loading progress in Android WebView. Bear with me, this tutorial is written in Java. You need to take the pain to make it compatible for C#. Now let us go back to our example, and take a look into how our activity class looks like.